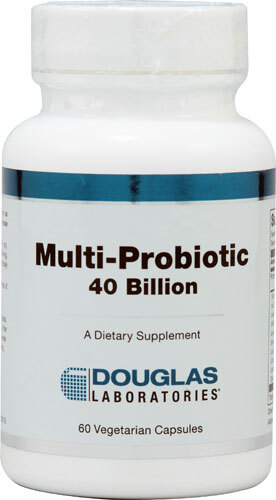 Best probiotic on the market! I take it daily and rarely suffer from gastro issues anymore. I have recommended it to friends and family and they have become fans as well. Excellent product! The probiotic my doctor and my gastroenterologist prefer! I have had stomach problems since I was a child (30+ years), these two doctors put me on Ortho Biotic and 6 weeks later, NO major stomach problems! It isn''t inexpensive, but considering what the last 30 years have costs in time, money and misery, it is worth it! I just wish insurance covered it! On antibiotics for Lyme Disease and this product helps to keep GI tract in proper order and also yeast manifestations from occuring. I would recommend. Since I started taking this product it seems to help with my digestion. I''ve always had issues with my bowels being constipated. This was highly recommended by my Doctor, this specific brand. (This product may contain one or more of the following: Calcium silicate, magnesium stearate, microcrystalline cellulose, and silicon dioxide). Ortho Biotic is a unique probiotic formula designed to deliver active organisms shown to promote healthy gut microflora, protect intestinal integrity and boost immune function. 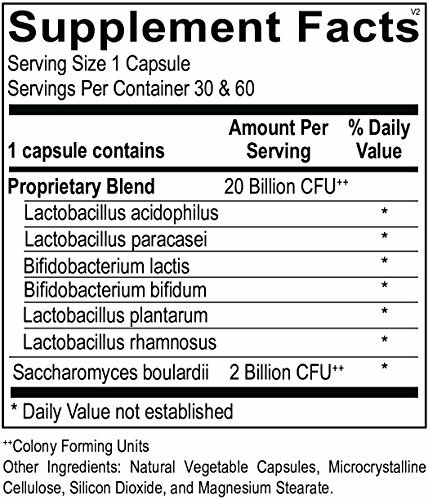 Included in this formula is Saccharomyces boulardii, an extensively researched microorganism shown to help restore microflora balance by enhancing commensal organism function. Each Ortho Biotic capsule provides seven proven probiotic strains chosen for their ability to withstand the harsh gastrointestinal (GI) environment and adhere to the intestinal tract to deliver superior results. Probiotics have been extensively studied and are characterized as having broad GI and immune benefits, including (1) increasing the population of healthy bacteria following microflora imbalance; (2) supporting healthy bowel function; (3) increasing the production of short-chain fatty acids, which provide energy to the cells of the intestinal lining; (4) strengthening the gut-immune barrier by promoting a healthy gut mucosa; (5) aiding in the digestion of difficult-tobreakdown compounds like lactose and casein; and (6) enhancing detoxification of harmful compounds. Because probiotics are live organisms, there are many challenges associated with manufacturing and distributing probiotic supplements. 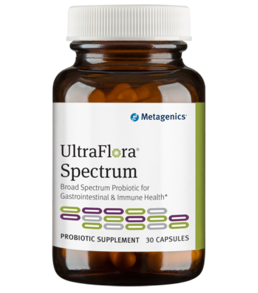 For a probiotic to be effective, it must be shelf-stable through the expiration date and precisely delivered to the intestinal tract, where it can have maximum benefit. BioShield® technology is an innovative manufacturing process developed to ensure consistent and reliable results. 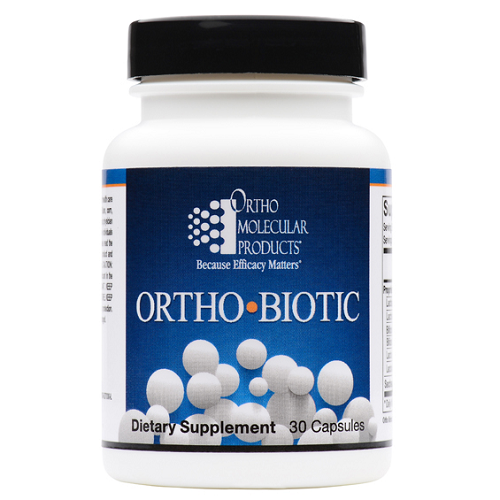 The microorganisms in Ortho Biotic are protected, sealed and freeze dried away from moisture, heat, light and oxygen. This allows the bacteria to remain dormant until they are exposed to moisture in the GI tract. By utilizing advanced encapsulation technology, the probiotic organisms are preserved and released on-target for maximum benefit. 9. Chytilová M, Mudronová D, Nemcová R, Gancarcíková S, Buleca V, Košcová J, Tkáciková L. Anti-inflammatory and immunoregulatory effects of flax-seed oil and Lactobacillus plantarum - Biocenol™ LP96 in gnotobiotic pigs challenged with enterotoxigenic Escherichia coli. Res Vet Sci. 2013 Aug;95(1):103-9.